A wonderful eye opening visit in every sense. We will be back! Thank you! A blissfully peaceful stay. We enjoyed everything – even the power cut. Thank you for lovely food, good company and very interesting trips. Exactly what we hoped for and more, bits of India off the tourist track, life as it actually is in villages, teeming life and livestock and the magic of the river. Thank you for the introduction to miniature painters, wall paintings, stories, great food, good company, walk through the fields. I loved the paintings in the City Palace and go back full of inspiration and memories. 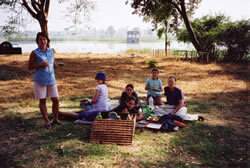 Activities beyond our farm include walking or cycling along the nearby cool waterways and secluded picnics on neighbouring farms. The young and flexible might like to view life from the top of a bullock cart. 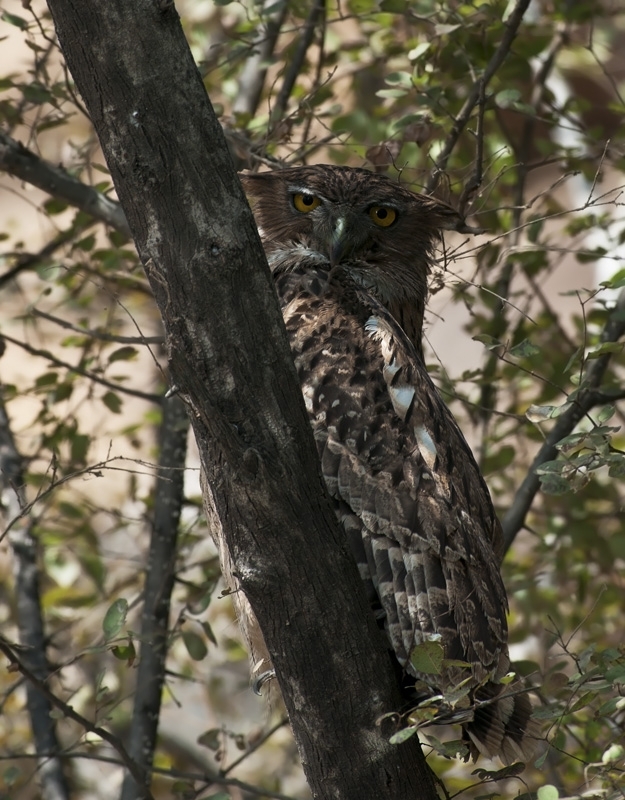 Why not use the farm as a base for exploring the Hadoti region with its National Park and Game Sanctuaries, stunning gorge, bird life, ancient Temples, Palaces, Forts and Buddhist caves, Kota Palace with its renowned murals, the Medieval town of Bundi with its splendid Palace and historic sites - all within easy reach. 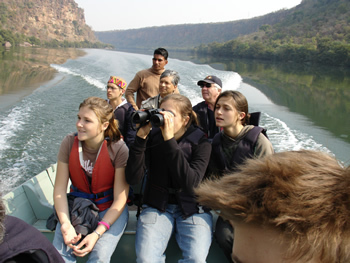 A boat safari through the magnificent Chambal gorge will take you past basking crocodiles and gharials. The famous Kota Doria saris handwoven in cotton, silk and gold threads are made locally. Prepare to be amazed by the greenery and the fertility of Hadoti. Suitable vehicles can be hired locally. The sheer scale of the complex, the view over the river and the richness of detail in the delicate fluted pillars, mirror inlays and superb murals make the palace so exceptional. 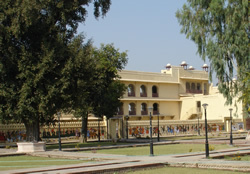 Rao Madho Singh Museum is in the Garh Palace and houses a fascinating collection of elephant howdahs and palanquins, arms and armour. Some excellent examples of the famous Kotah School of miniature paintings are on display, as well as old photographs, the regal insignia and memorabilia. Open 10:00 a.m. - 5:00 p.m.
Kaithoon, which is 22 kms. from Kota (just 4 kms. 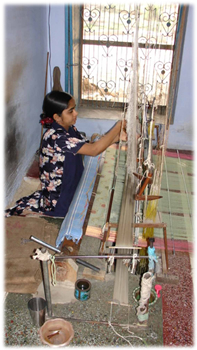 from us), is famous for its weavers. 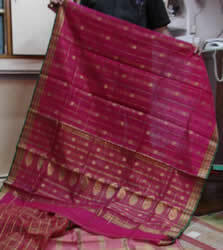 They employ special light weaving techniques using cotton and silk, with gold and silver zari (threads) to produce material in colours subtle and vibrant. The weave is known as Kota Doria. Their light cotton saris are renowned for their coolness and are much sought after. This handloom industry is now under threat from machine made imitations from Kolkata (Calcutta) and cheap synthetics. Find out more about the origin of this industry on our History webpage on this site. We often take our visitors to see the weavers. Most can't resist acquiring a sample or two of their wonderful cloth. 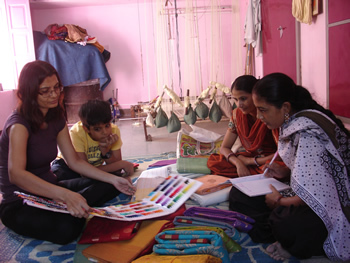 Here we have our guests commissioning saris in their own choice of colours. 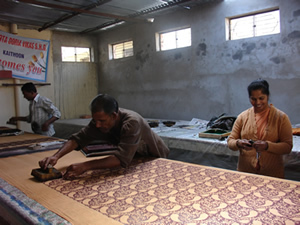 Hand block printing has been reintroduced after a gap of twenty five years. 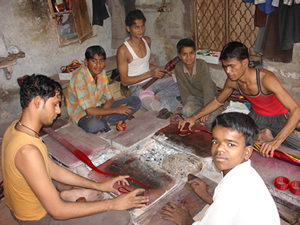 Making bangles out of lac is another craft that is present in Kaithoon. 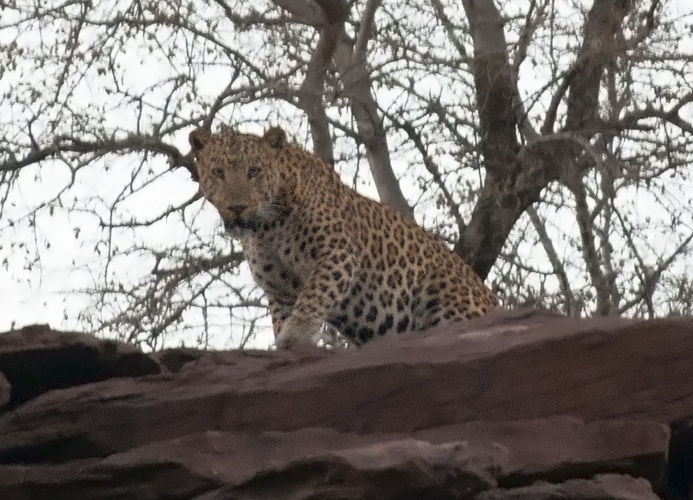 There are many picnic spots on the River Chambal. For those who prefer to look down on the gorge there are a number of vantage points. An excellent vantage point is at Garadia Mahadev, which is 25 kms. south-west of Kota on National Highway 76 to Dabi and Chittorgarh. One of our favourite spots is on a farm near to us which has an old shooting lodge on a lake that used to belong to the Maharajah of Kota. The lake is full of water birds. Explore the old city on foot, by cycle-rickshaw, or on horseback with a guide. The city walls were rebuilt in the 19th century and are said to be the thickest and most complete in Northern India. 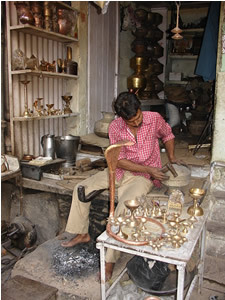 Watch craftsmen making brass pots or whicker stools. See leaf plates for sale and camel skin shoes. Experience the sights, sounds and smells of traditional India. This small cemetery in Nayapura, Kota has been restored recently. It is associated with tragic events that shook Kota, and India, in the troublesome year of 1857. 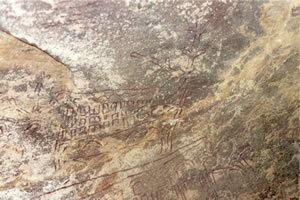 The style of the tombs and inscriptions will leave a lasting impression on visitors. Find out more on our History webpage on this site. 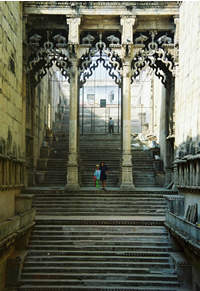 Bundi is a historic city which retains an old world charm that is fast disappearing from many of India's cities as they embrace globalisation. Not so with Bundi. Tucked away in the foothills of the Aravalli Range, it conjures up a nostalgic past. Rudyard Kipling spent time here and aspects of Bundi may well have found their way into his stories. This complex of extraordinary temples dating from 9th century A.D. is situated 48kms from Kota in a secluded and peaceful wooded grove. 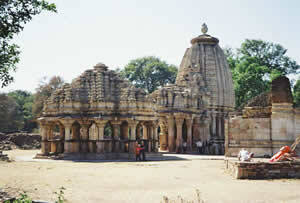 The centrepiece is the 10th century Ghateshwar Mahadev Temple dedicated to Lord Shiva. The quality of the carvings here is unrivalled anywhere. The Temples have been sensitively restored and the surrounding gardens are well maintained and clean. The mature local trees are a tiny remnant of the native woods that once graced large parts of Hadoti. This former Royal Palace has been beautifully restored and is well worth a visit. 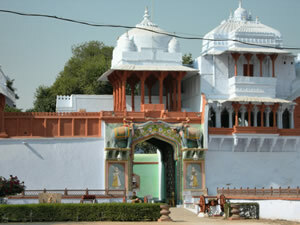 It lies 10kms from Kota on the way to Chittorgarh. Abhera overlooks a small lake which is frequented by flamingos and other water birds in the winter. The lake is teeming with bird life. The Mughal gardens have been restored and a small boating lake is being made for children. One interior suite has been decorated in the Kotah style of painting, and fresco murals form a major frieze along the Palace wall. There will soon be a cafe with views over the lake. Alnia is about 30 kms. from Kota. A small river with same name flows nearby. Along the river at various places there are rock paintings dating from the pæleolithic period, 20,000 - 18,000 B.C. Visitors will find a good number of spots with rock pools to sit by and enjoy the place.